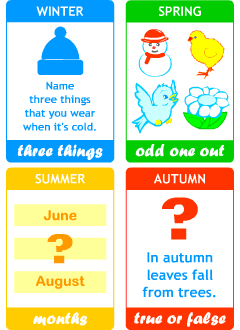 This is a board game with cards for 2-4 players (or teams) to practise talking about seasons of the year in English. Shuffle task cards and put in a pile face up (answer side down). 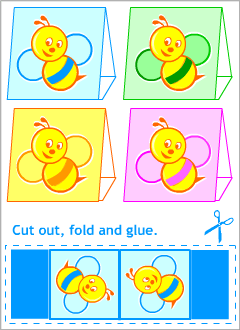 When you land on a square with the flower, you take a task card from the top of the pile, then you have to follow the instruction or solve the puzzle on it. For example, Name three things that are white. Snow, snowball, snowflake. 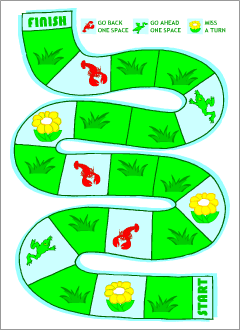 A game board that works well with playing or question cards. 24 cards with tasks and questions to play language games.